Two massive, rain-soaked cities on opposite sides of the world are struggling with swirling, brackish waters that have brought death and devastation. For Houston, it's unprecedented. For Mumbai, it's painfully common. For India's financial capital and other South Asian cities and farmlands, floods are regular, cataclysmic occurrences made worse by breakneck urban development and population booms that will only become more challenging as climate change increases disaster risk. 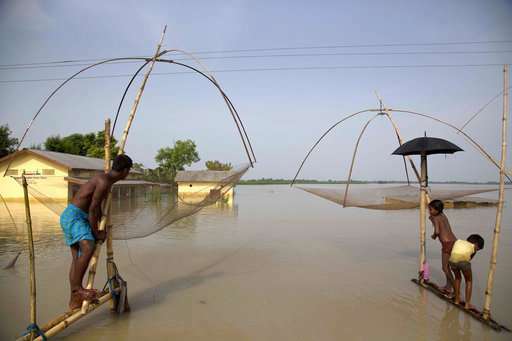 In the last two months, more than 1,000 people have been killed in flooding events across India, southern Nepal and northern Bangladesh. Some 40 million more have seen their homes, businesses or crops destroyed. Mumbai was especially hard hit, with water swamping offices, schools and roads and about 60 people killed—33 alone in Thursday's collapse of a 117-year-old apartment building whose foundation had been weakened by the flooding. "The city was brought to its knees," said Darryl D'Monte, a Mumbai-based environmentalist. Such tragedies happen almost every year in South Asia. The amount of rain Hurricane Harvey dumped on Houston was unprecedented not only for the city but also for the continental U.S. Mumbai, meanwhile, experienced similar flooding just 12 years ago, and several major Indian cities have been inundated since then, including Kolkata in 2007, Hyderabad in 2008, Srinagar in 2014 and Chennai in 2015. The death toll is often high, as it is this monsoon season, because of factors that include inadequate housing. In Mumbai alone, some 3 million people are crammed into low-lying slums and have few places to flee to when floods hit. Experts say Indian officials are doing little to reduce the risks. Instead, they allow new construction, paving over floodplains, denuding forests and testing river banks. Mumbai authorities have ignored plans to upgrade the city's British-era drainage system, clear drains of plastic debris and install pumping stations and flood gates to get any floodwaters out, D'Monte said. "In most cities, lakes, ponds and even wide-open spaces acted as sponges to absorb excess rainfall. These have all disappeared from our cities and towns as water bodies are filled up and buildings come up in their place," said Chandra Bhushan of the Centre for Science and Environment, an environment think tank in New Delhi. "We are becoming very good at weather forecasting. But we are very poor in putting that forecast information into decisions and actions," he said. For north Indian farmer Avdesh Singh, predictions are of no consequence. Days ago, Singh watched as his home and fields sown with lentil crops were submerged in the village of Narayanpur Jaisingh, in state of Uttar Pradesh. He had managed to flee with the five other members of his family to a nearby highway, where they camped in the open for five days before being rescued. "This was a dry area. We yearned for rain. But not this way," he said. "Our world has turned topsy-turvy and there's no going back." Scientists have warned that flooding events will only become more frequent, as climate change brings stronger storms and makes rainfall more erratic—a key danger for those living along both the Bay of Bengal and the Gulf of Mexico, which are considered "hurricane alleys" for the strong storms that barrel through. Already, average temperatures across India have risen some 1.8 degrees Celsius in the last century. That extra heat increases evaporation, which makes storm clouds heavier. Higher temperatures are also increasing snow and ice melt in the Himalayas, sending more water rushing to the plains. "Extreme rainfall events are going to be a part of our lives. If that is the case, how do we design our cities?" Bhushan said. "The current chaotic, business-as-usual urban sprawl is a recipe for disaster." In addition, year-round farming is clogging irrigation canals and widespread deforestation has contributed to soil erosion, reducing the ability of land to absorb water. Those were key reasons for India's deadliest flooding of this monsoon season. 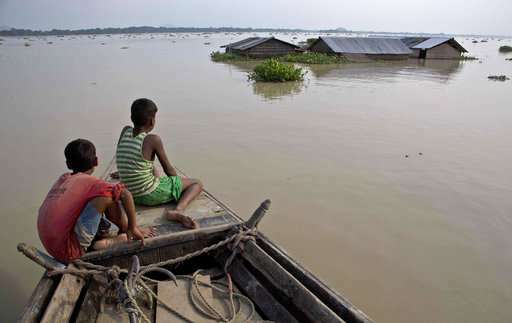 Nearly 520 people were killed last month in northern Bihar state, where silt-filled rivers couldn't cope with this year's high volume of water, said Dinesh Mishra, an environmentalist who has studied Bihar's flood patterns for years. He blamed the state's decision in the 1950s to build embankments along those rivers for tripling the area now prone to flooding. "Instead of constructing these embankments, the government should have pushed ahead with a plan to remove the silt from the rivers," he said. These problems are not confined to India. Recent floods in neighboring Nepal killed 149 people and left 27 missing, while also damaging or destroying almost a quarter of a million homes. There, too, experts blamed deforestation and land degradation for a tragedy made worse by a lack of preparation and an institutional inability to cope. "Some people were given some warning about the flood, but they were not told where to go in such disasters," said geologist Shree Kamal Dwivedi with Nepal's Department of Water Induced Disaster Management in Kathmandu. It should be urgent now for authorities to figure out how to cope with future flooding, he said, given that "global warming and climate change is contributing to the change in rainfall patterns" and threatening to make things worse. Many governments in India, Bangladesh and Nepal say they don't have the money to make major changes. Still, there have been some improvements to flood preparations, including test versions of early flood warning systems and better protocols for disaster response. But experts say officials need to heed those warnings, and police and soldiers need disaster management training if they are going to continue to be deployed for rescue efforts. In Mumbai, there is obvious room for improvement. On Aug. 24, weather forecasters predicted heavy rain was on the way. But the warning by local authorities to close down schools and asking people to stay home came five days later. By then, no warning was necessary. The roads were already waist-deep in water.